Project 2292: Z.-X. Luo, S. M. Gatesy, F. A. Jenkins Jr, W. W. Amaral, N. H. Shubin. 2015. 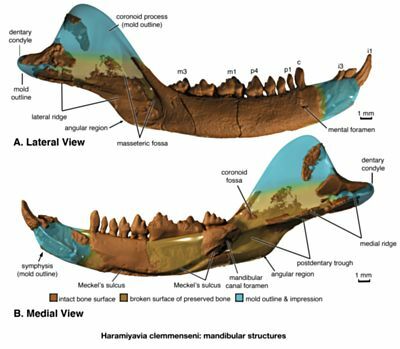 Mandibular and Dental Characteristics of Late Triassic Mammaliaform Haramiyavia and Their Ramifications for Basal Mammal Evolution. Proceedings of the National Academy of Sciences. Luo, Z.-X., S. M. Gatesy. 2015. Mandibular and Dental Characteristics of Late Triassic Mammaliaform Haramiyavia and Their Ramifications for Basal Mammal Evolution. Proceedings of National Academy of Sciences USA. National Academy of Sciences, U. S. A., Washington DC.